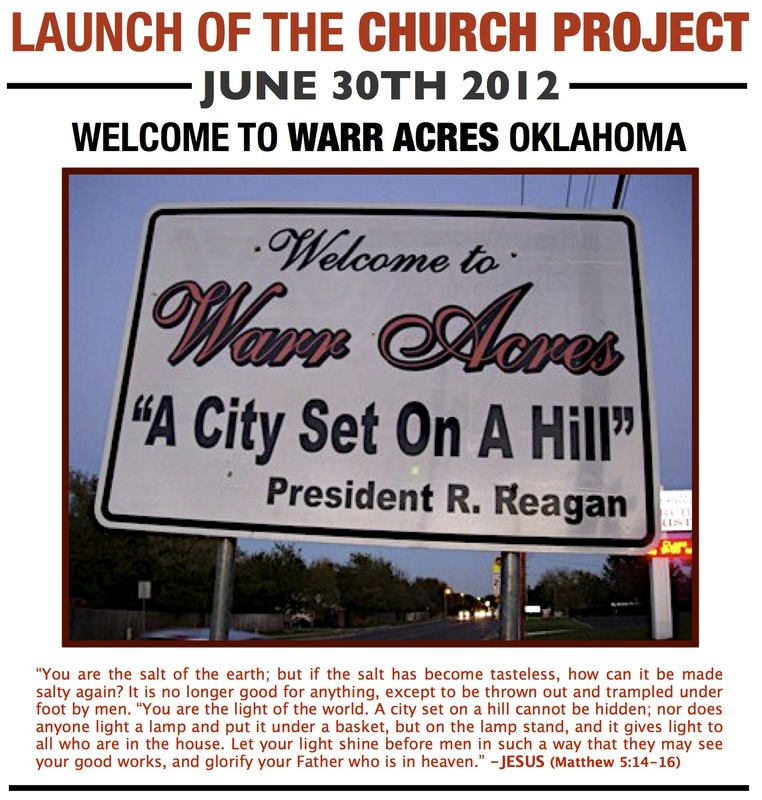 Why are we launching the Church Repent project in Warr Acres, Oklahoma? 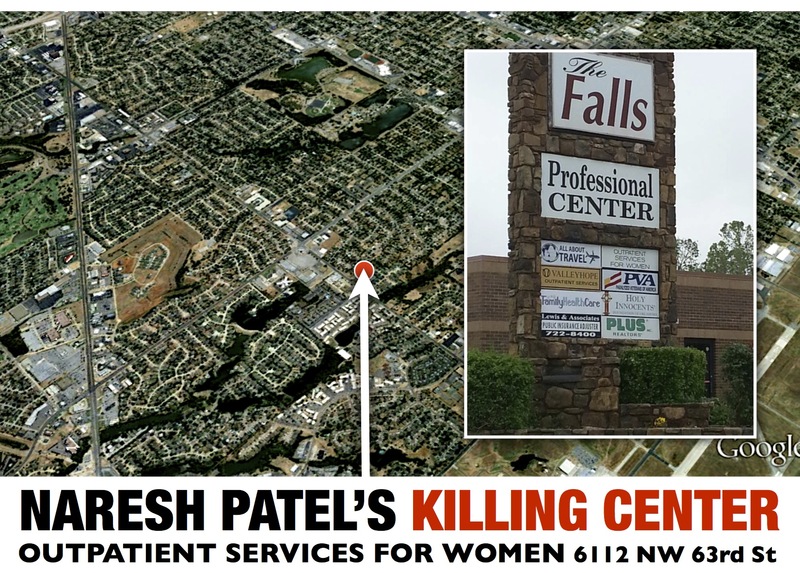 Warr Acres is the home of Outpatient Services for Women, an abortion facility run by Naresh Patel. 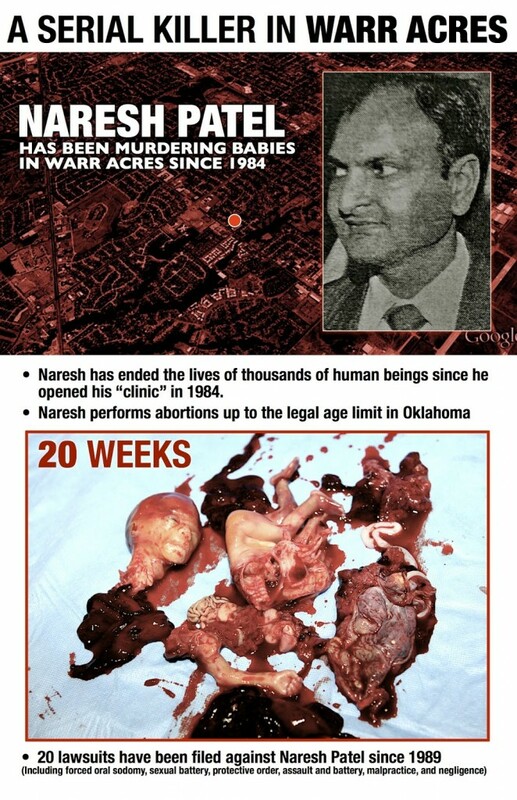 It is in Warr Acres that Naresh Patel “lies in wait for blood” (Psalm 10:8; Jeremiah 5:26) “makes the fatherless his prey” (Isaiah 10:2) and profits from the extermination of innocent human life. It is here that women “stumble to the slaughter” (Proverbs 24:11), where men and women destroy the evidence of their infidelity, where mothers and fathers willfully take their children to be sacrificed on an altar of convenience and shed innocent blood in a misguided or selfish desire to preserve their way of life. It is here that pimps take their workers to keep their business booming. It is here that pedophiles take their victims to destroy the “evidence” of their crime and enable the continuance o of their abuse. This is the place where abandoned women and fatherless children face great affliction (James 1:27). 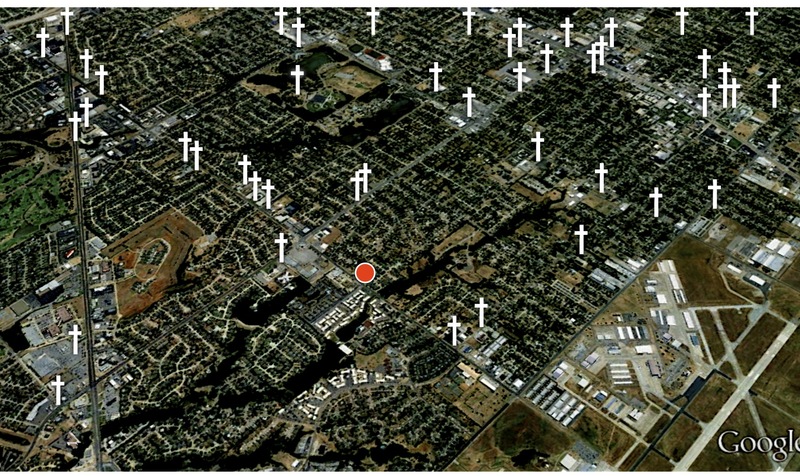 And the saddest fact of all… Naresh Patel’s Killing Center is surrounded by churches. This facility has been in operation since 1984, in which time Patel has murdered thousands of unborn children. This abortion facility is surrounded by a number of churches, the vast majority of which have demonstrated no bold or visible opposition to the presence of Patel’s operation. 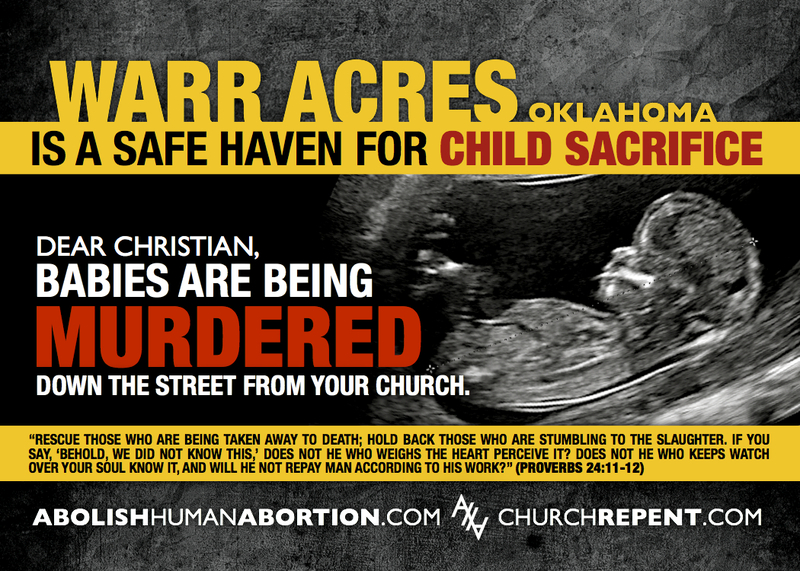 It is for this reason that we exhort the churches of Warr Acres, Oklahoma to take a visible stand against the slaughter of unborn human beings in their community. We have begun calling and emailing every church in the 2 Mile radius of Patel’s Abortion mill. We have begun leafletting the churches which we cannot seem to reach by phone or email (we are sending emails and making phone calls but not getting a whole lot of replies). Here is the front and back of the leaflet we are placing on cars in this area. 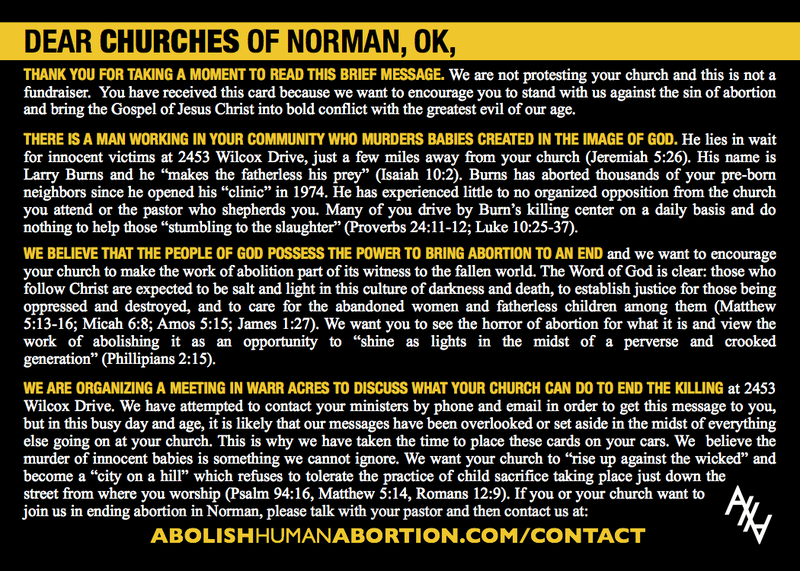 A member of the Abolitionist Society of Oklahoma attempted to start a group at his church in Warr Acres that would have focused on ministering to women stumbling to Naresh’s abortion mill, but was discouraged and barred from doing so. We have focused on this church, calling and emailing them a number of times. We have found out that they are at peace with abortion. (To read about our attempts thus far to contact and exhort LifeChurch.tv, go here). More information about Naresh Patel is available here.